This entry was posted in FUN!, Teddy and tagged Animals, Blog, caption, cat, Cinco de Mayo, crazy cat lady, fur ball, Humor, Nashville, personal, Pets. I need three hats like that, CBXB! For me, Karen, and Ellie B aka Dogamous Pyle. Happy Cinco de Mayo! I’ll round some up for my three amigos next year. Happy Cinco de Mayo! Happy Cinco de Mayo to you and yours!! Today is my sweet boys 14th birrthday! we partying..not like you..(*sigh*) but…. Oh well happy birthday to your sweet boy! I’ll cheers to him this evening! I have a better idea…. HELLO…..
do a reall good hot selfie…tell him you think he is hot. LOL….tell him happy BD..HAHA…he is ALL in to blondes girl…ALL IN….his name is Jesse. he will think he has died and GONE to heaven…DOOOO IT!! OMG. Just saw this. Will send him a belated birthday message STAT! Hope you get a your paws on a bucket of margaritas too!! Margaritas are in my very near future…hope they’re in yours as well! After this weekend the hair of the chihuahua is necessary! Cheers!! That hat is the best thing I’ve seen all day. We would love to share accessories with you! Let’s put that on our bucket list, shall we? Happy Margarita Day! Very chic indeed. 🙂 Enjoy the festivities and the margaritas. Oh you know we’re nothing but chic over here in my neck of the woods! I have a countdown ’til margarita time…only 1 hour and 42 minutes! Those hats!!!! Happy Cinco de Mayo! Don’t let Ted drink and drive (or twerk). Happy Cinco de Mayo! Don’t let Ted get too drunk! Ted is still hungover. That cat! What about a hat for New Cat? Ridiculously Happy Cinco de Mayo my friend. 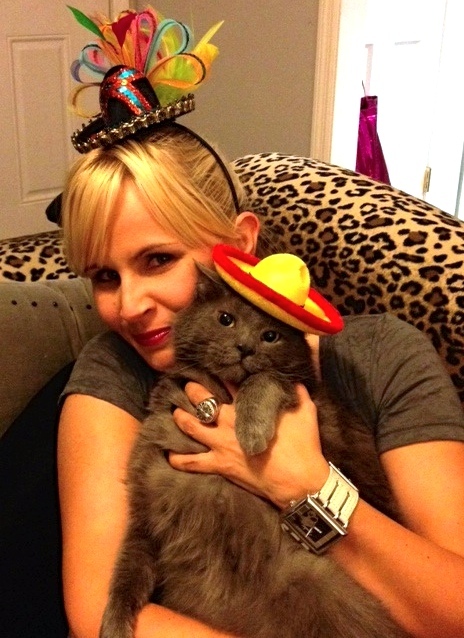 If ya want to avoid the claws to the face, then it is tequila shots for Ted BEFORE the hat goes on for the pic. He should chill a bit more after that, and then you get all the fun of trying to catch up to his inebriated state. I don’t know why I just don’t consult you with every life choice I have to make before I make it! Hello! Tequila for Ted is certainly the way to go before trying to snap a pic. So, now that I’m armed with your fabulous advice, I will be buying gallons of the libation so our Halloween costume adventures go smoothly this year. Actually I may have over reached a bit. Just make sure that you assess whether or not the great Ted E Bear is an angry drunk or not. It could help but it could also go horribly wrong. LOL. Just lookin out for my adventurous friend. Have a good one CBXB. Oooh! Most excellent point. I will be sure to find out if Mr. Bear is a fun, depressed or angry drunk immediately. Thanks for having my back! Always. Have fun as usual. He looks so innocent and sweet, I just love this photo. What did he do to retaliate? I love that you know better than his sweet and innocent face! He barfed on my bed last night. Tough crowd, hope you help youself to a Captn! Lots and lots of Captain indeed! But that’s normal for the tough feline crowd I’m enthralled in daily. Hi Megan, Saw this photo and immediately thought of you!! Resend the photo! I didn’t get it! I just pissed my pants. Happy weekend and cheers, Teddy have always right 🙂 !